HF Q’s: Should I get a male au pair? Having a male in the house. We have had single-mom and single-dad host families get male au pairs. The single-moms like having a man in the house to give their children someone to look up to and the single-dads often feel more comfortable with another guy in the house. Easy-going personality. Most of our male au pairs are really easy-going and they don’t let muc h upset them. They also tend to be fairly independent, which can be very nice for a busy family. Grateful for the opportunity. The amount of families wanting a male au pair is very small, so most of our male candidates are very happy for the opportunity to speak with an interested family. Many agencies don’t even offer male candidates, but we at Au Pair International want to give everyone a chance to find a family if they meet the requirements. I suggest being open to the possibility of having a male au pair. We have had host families who originally never even considered getting a male au pair, but then saw a profile on our site and decided to give a male au pair a chance. They said it was the best decision they could have made. Here’s a great picture of one of our au pairs and our Saint Paul, MN area director at a Minnesota Twins baseball game. They had a great time! HF Q’s – Do I have to get my au pair a cell phone? The answer to this question is… it depends. Specific, I know, but each situation is different. Really, host families are not required to get their au pair a cell phone but they also cannot require that their au pair get a cell phone either. Most host families do provide a cell phone for their au pair because they want to be able to get in touch with their au pair throughout the day. I recommend to host families that they talk with their au pair about what both they and the au pair would like to do before the au pair arrives in the host families home. Some au pairs might have their own phone they would like to use and others might want to upgrade the phone or the plan that the family was planning on getting. I also recommend not putting your au pair on the family plan unless you have a lot of minutes and texts (especially texts!) You can get a prepaid cell phone for a pretty reasonable rate and then your au pair can top off the minutes if she runs out. Finally, if you do not have a home phone, you really should have some way for your au pair to call during the day. This is both for safety reasons and so Au Pair International can reach your au pair if we need to. HF Q’s – Can my au pair take care of my baby during the night? Yes, your au pair can take the night shift. Many new moms love the fact that they can schedule their au pair at night. You still need to give your au pair a schedule with a specific start time and end time and you cannot ask your au pair to work more than 10 hours per day or 45 hours per week, even if the baby is sleeping for the majority of the shift. An example of this would be if you would like your au pair to be on duty from 2 am until 6 am so you could get a few hours of uninterrupted sleep. Even if the baby slept that entire time, you could only schedule your au pair for 6 more hours that day and she would need 8 hours before the start of work the next day in order to rest up and relax. 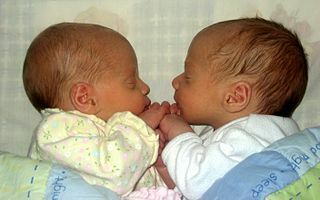 Finally, remember your au pair cannot be left alone with a newborn younger than 3 months old. Photo courtesy of Wiki Commons. The first week of the Fall Photo Contest has officially past and we are anxious to see the pictures of you making these fun items with your host family! Below you will find a re-cap of all the crafts and recipes we have highlighted this week on our Facebook and Twitter pages. Each of these crafts are family friendly and sure to bring a smile to the little ones you work so hard to care for each day! As always, be sure to get the permission of your host family before submitting their photos to aupairsupport@aupairint.com for entry into our Fall Photo Contest and a chance to win a $50 gift card! For complete Contest Details, Rules, and Regulations Click Here! The first craft idea for our Fall Photo Contest comes to us from www.glorioustreats.com. 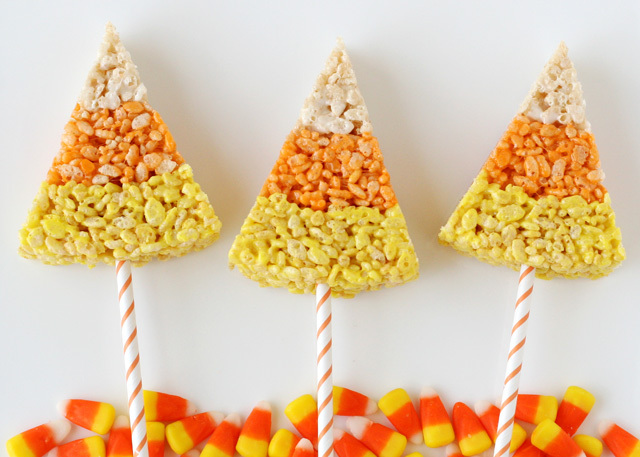 These Candy Corn Krispie Treats will be lots of fun to make with your host family! Don’t forget to take pictures and get the permission of your host family before submitting to aupairsupport@aupairint.com. No limit to the number of contest entries! Click Here for directions on how to create these cute fall treats with your host family! Autumn is officially upon us and many of you are beginning to see beautiful red, orange and yellow colored leaves in your area. What better way to utilize these bold and bright autumn colors than to create this beautiful leaf mask which comes to us courtesy of www.5orangepotatoes.com! Not only will your host children have a blast making these, but the field trip to collect the materials will surely be one to remember! Click Here to find detailed directions on how to make these with your host family and remember to get permission before submitting their photos to aupairsupport@aupairint.com for entry into our contest! For our next fun recipe/craft idea we found these adorable Scarecrow Cookies from Metro Moms Blog! We would LOVE to see you make these with your host children and send the pictures to us for the Fall Photo Contest. Click Here for the recipe! As always…remember to get the permission of your host family before submitting their photos to aupairsupport@aupairint.com. Happy Crafting! I n the spirit of the fall season, our next recipe comes to us from http://zakkalife.blogspot.com/. 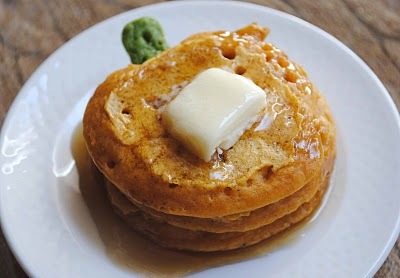 Baking together is a great bonding experience and what better recipe to get started with than these pumpkin pancakes! These will be fun for the entire family to make and the children will love eating them! Try adding chocolate chips or candy corn to create a spooky jack-o-lantern! Click Here to find detailed directions on how to make these with your host family and remember to get permission before submitting their photos to aupairsupport@aupairint.com for entry into our contest! Our last fun craft idea for this first week of October is provided by www.kaboose.com. 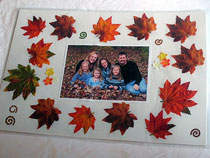 These fall themed photo placemats are sure to become treasured keepsakes that will be enjoyed by your host family for years to come! What a great way to frame your memories! Click Here to get a supplies list as well as detailed directions on how to create these for yourself. Don’t forget to take pictures and send to aupairsupport@aupairint.com for entry into the fall photo contest! Please do not hesitate to email us at aupairsupport@aupairint.com if you have any questions regarding the contest and we will be happy to help! One of the hardest parts of being an au pair can be meeting people and making friends. Even though you are living with a family, being an au pair can be very lonely, especially at first. Most au pairs who are brand-new to a country don’t know anyone outside of their host family. Even those who did their homework, asked all the right questions, and landed with a really great host family, getting to know people outside of your new home can still be tough. Especially at first. For me, I was fine when I first moved to Germany as an au pair. I had a few friends in the country (although none nearby). I also had a great host family who took me out to see the area and introduced me to their family and close circle of friends, which was fantastic and very kind of them. But at some point I was ready to make friends of my own, especially close girlfriends. You may be in a similar situation and wondering how to meet people. Language class – I can’t recommend this enough. My closest friendships were made through my German classes. The courses I signed up for were pretty crappy (my German teacher was actually Russian, if that tells you anything). But I made some great (and lasting) friendships during my classes. Granted, once you make friends you may spend more time skipping class than attending (consider yourself warned! ), and you will quite likely have to step out of your comfort zone to meet new people, but language school is a GREAT way to meet other people. Go to church – Seriously. I met some really great people through a church in Stuttgart and through Bible studies at one of the universities in the city. And believe it or not, some of these people were really cool, and not crazy Bible-thumpers. (For those who do not attend religious services, maybe you could look for groups/meet-ups on things that interest you – either hobbies, sports, or something similar). Just get out there – Sometimes you just have to get out and talk to people. And although it can be intimidating, you can meet some great people by getting over yourself and talking to strangers. One of my best friends and I made some great friends by going out and talking to people at our favorite hangout. We didn’t have time to wait around to meet people, so we took it upon ourselves to talk to people who looked like fun, and we made good friends this way, even in Germany, where people tend to be a bit more reserved than what we were used to. So here’s one au pair’s suggestions, what are yours? What’s the best way to meet people in a foreign country? We at API hope that school is off to a good start and everyone is transitioning well. There has been some questions about schedules with the start of school so your Regional Directors wanted to address those questions. As you know, the regulations state that au pairs can work up to 10 hours per day and 45 hours per week. This includes the time that is necessary to get the child-related housework done. Families need to give their au pair a schedule with a start and end time and au pairs need to be dressed and ready to go 5 minutes before that start time. When it comes to the time that au pairs are suppose to be off, we know it is difficult to be home at an exact time every day, but it is important for families respect their au pair’s time off and try to be as consistent as possible. and with the permission of the host family. Host families, please recognize that your au pair will need some down time once her time is over. Just like you need a break from your job, your au pair needs a chance to relax once you take over. Au Pairs, you need to remember that this is an exchange program and part of that is interacting with the family like a member of the family. You should pitch in at times, without being asked. If everyone is cleaning, you should be cleaning too. If your family is making dinner, you should ask if you can help or volunteer to watch the kids. While you do need your alone time, you should not be disappearing into your room whenever you are not on duty. On the flip side, your host family is going to want some time to just be a family. Please be understanding of that. The most important thing is to communicate with each other and come to an agreement that works for everyone. Please take some time this month to look at your schedules, discuss the changes that might be happening with the start of school and discuss how best to manage them together. Your area directors will also be addressing this with you.